I have not read of many players using the Meroitic-Kushite, but in my opinion DBA 3.0 have certainly moved them up a notch as being an army with potential. In addition to their troop mix they are one of the few African armies that have steppe as home topography. 1 x general (Cv), 1 x cavalry (Cv), 2 x Meroitic archers (3Bw), 5 x tribal spearmen (Sp), 2 x tribal swordsmen (4Bd), 1 x herdsmen (Ps). Rome as attacker positions troops on gentle hills securing both flanks and places in the centre all the legionnaires and heavy cavalry. The Kushite has positioned their forces facing the Roman centre with a small group prepared to seize the hill on the Roman left. Kushite spear drive forward to take out a unit of legionnaires sending the rest back on their heels. On the flanks Roman troops are maneuvering to envelope the Kushite wings and to counter this, the Kushite general moves his cavalry to the right while a unit of archers deploy to take care of the light horse. 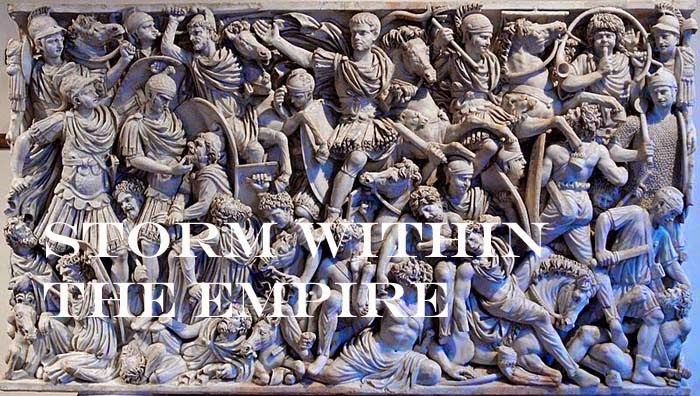 In a brief moment Roman resistance simply fell apart as the Clibinarii were cut to pieces, light horse were emptied from their saddles and units of Roman foot were being encircled by savage tribesmen. Score 5 -2 for the Kushite. Game one proved to be a wake-up call and as defender Rome changed her deployment to form three battle groups. Seeing this, the Kushite general would lead with the right to clear the hill of the cavalry and eventually wheel left to support the main body confronting the Roman foot. Movement forward was hampered by poor communication between Roman command and troops but the cavalry did manage to reach the crest in time with only 100 paces separating them from the advancing Kushite spear. The Kushite spear struck the cavalry line and littered the hill top with Clibinarii dead and sent the rest recoiling back. This proved their undoing as the cavalry withdrew off the hill and would eventually be seen moving off to support their infantry. On the Roman right, the legions with auxiliary support struck the Kushite left. The Kushite general needed every bit of attention (pips) to adjust his line to meet the Roman attack. Realizing the danger a number of units were reforming to aide their general. Roman drill and technique resurfaced as the legionnaires cut down Kushite tribesmen as many were hampered by their own troops and could not flee including their general. Score 1 – 5 for Rome. Now defending the Kushite formed up in one large formation flanked by swordsmen and behind in a second line was light troops and cavalry. Rome deployed in a formation similar to the last battle; legionnaires supported by auxiliary in two groups with cavalry protecting both flanks. Securing the hill top position, the Kushite general moved units from his reserve to seize the second hill to support the right flank. Meanwhile, the Roman line moved steadily forward while light horse took advantage of the situation to threaten the Kushite rear. Both lines struck and subsequent turns brought the lines moving to and fro with nearly every Kushite unit being pulled into the conflict. The Roman light horse wheeled to the left to add their blades to the struggle taking place at the hill top. Kushite swordsmen pursued elusive Roman auxiliary leaving the spearmen to deal with the Roman legionnaires, this left the general no alternative but to deal personally with the light horse threat. This was unfortunate as the continuing combat took the general and his bodyguard off the hill leaving the rest of the army bereft of their commander; subsequent turns meant Kushite units looked to their immediate chieftains or warlords for commands (extra pip costs). Rome quickly seized the opportunity to cut down isolated units yet despite the loss of their commander the Kushite defiantly formed a shield wall. Victory came when Roman cavalry swept the second hill of the remaining Kushite cavalry. Score 2 – 4 for Rome. Great game Picts, I also took a bunch of turn by turn game pictures. Fun to go over old games. I am glad you like the reports. When the series is complete there will have been 34 matches totaling 102 games. What has not been touched on is the importance of terrain placement. In some instances an attacker deliberately denied his opponent favourable terrain but hampered his own deployment by doing so. At times the choice was not always a good one. That is one reason the cord remains in place marking the half-way line; quadrants are noticeable and the speed of movement can be better determined. Game illustrates the huge importance of side support in 3.0. Roman army has a combat value against foot of 42, with one knight capable of inflicting quick kills. The Meroitic army has a value of 39, if you consider the spear a 4 vs. foot, but 44!, if the spears gain side support. Against mounted the Kushites are worth 42 total, the Romans only 34. The Roman Aux are in a world of hurt at CV 3 against Kushite spears and blades.Sadly, they are also SLOW aux, so putting them in bad going will make them a Pip drain or leave them out of combat. I would have aimed to put the Cataphract against whatever unit is on the end of the Kushite line, and then give up an overlap on the other side if I had to in order to get the Cataphract in with an overlap to take advantage of either the quick kill against bows or spears. Severan bow is also slow, so again doesn't function as well in bad going where you would like to hide it to keep it away from blades and spears.